Mathiveri is an inhabited island of Alif Alif Atoll in the Maldives. 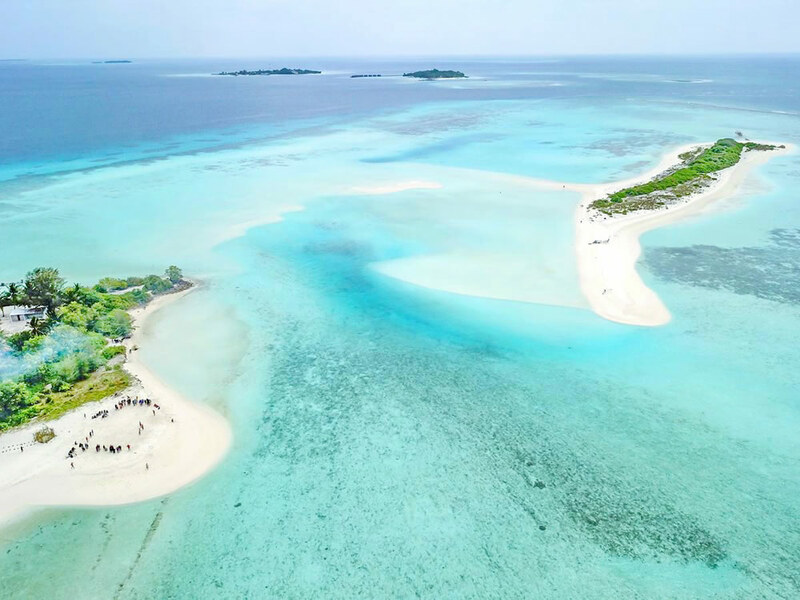 A great option for budget travellers, the island of Mathiveri is located on the North Ari Atoll, which is about a 30-minute seaplane ride, 2 hour by speed boat or 6 hours through public from the main island of Malé. Mathiveri Island is not just a guest houses but an experience. The white beaches, sparkling clear waters, a healthy reefs and the ocean is teaming with marine life. An experience where culture, beauty and comfort blend together to bring you the best of what Maldives has to offer without maxing out your credit cards. There are some ways to get to Mathiveri, but the most common transfer is a speedboat. Upon the arrival your's hotel representative will be meet you at Malé International airport and will guide you to the next Transfer Terminal. They will arrange your's speed boat trip from the Velana international airport to Mathiveri and with their instructions it be really easy. Transfer is compulsory when you book the stay. Speadboat takes 2 hours to reach Mathiveri Island and costs USD50 per person one way. Advance booking (5 days prior to arrival) is required for speedboat transfer. ​Ferry Route with transfers via Rasdu - Ukulhas. Travel by slow ferry takes 6 hours. Immediately upon leaving terminal building, you will meet the staff who will assist and guide you to Mathiveri Island. Transfer by ferry service will be scheduled transfer which clients must be present at terminal before 15 minutes. Ferries to Ukulhas depart from Male (Villingilli terminal) at 09:00, Sunday, Tuesday, Thursday, the journey time is 4 hours 25 minutes, the price for the trip is $ 4, one way. Departure from Mathiveri: Saturday, Monday, Wednesday at 8:30am. The local ferry between Mathiveri, Bodufolhudhoo and Ukulhas runs every day. Of course, there is a possibility to book a seaplane to the nearest resort (Nika Island), but this trip will costs more than $ 250 one way per person + extra boat to the island. You can rent also a private boat from Male if you are traveling in a large group (about $ 800/boat in one way, available 24 Hours), but these methods are less common. Nestled on the western edge of the atoll, Mathiveri is one of the 8 inhabited islands of Alif Alif Atoll. The island is only 85 Km away from the capital city Malé of the Maldives. The island, surrounded by the breathtaking Indian ocean, measures about 0.8 km in length and around 0.5 Km in width. Matheveri is a small island with 800 locals living there, there are two football grounds, a police station, small hospital/clinic, pharmacy, childrens playground, the only dive shop, school and a couple of gift shops (with many nice things and the prices are good), 6 mini-marts, bakery and 3 cafe are convenient for grab a drinks, savoury snacks and cakes.The cost of food is quite reasonable to say your on an island, large bottle of coke/sprite $1.6 . The best thing about this place is the Maldivian life and local people that are very friendly. The views and the barefoot atmosphere are perfect and the island is safe and quite small, you need less than 5 min to reach any it's side. The lagoon and beaches are wide and you can walk (or swim with ease) for several hundred meters in the sea before it gets too deep. In general, there are three beaches on Mathiveri: a beach for locals, a tourist beach (aka bikini beach) and Stingray beach. The latter got its name due to the accumulation of stingrays, which can be observed throughout the day here. The best time to watch is early in the morning, when they are very close to the shore. Set on the island's wester side, bikini beach 5 mins walking from the doorstep with free of charge sunbeds and umbrellas, the beach is not so big but nice, clean, sandy and almost empty, we could take a sun bath in a very private atmosphere. Here you can swim and play in the bikini. We also recommend taking water shoes. The beach for locals is located in the southern part of the island and has a beautiful meadow. 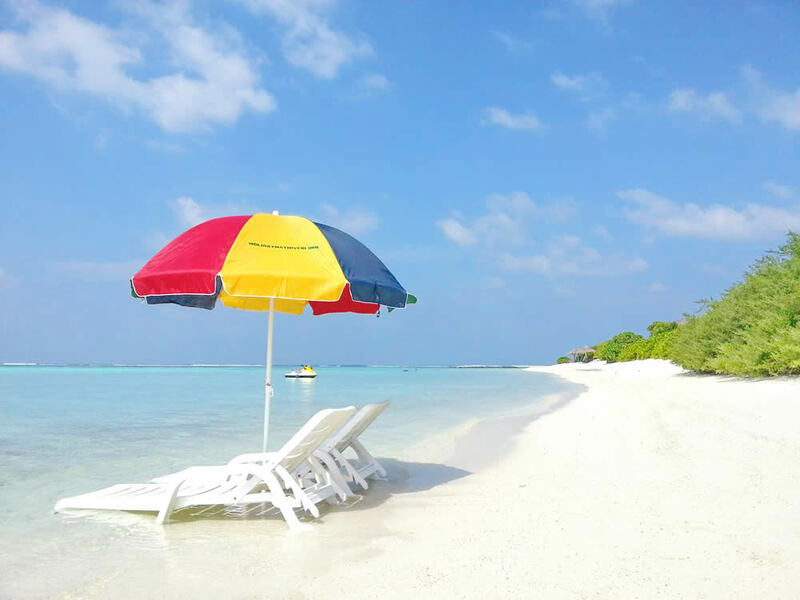 Opposite this beach you will find a picnic island (Mathiveri Finolhu) which can be easily reached by swimming. However, be careful! In the middle of the path can be quite a strong current. Also you can rent kayak (foк $25/day) to get there. The most exciting snorkeling spots are located on the bikini beach and around piknik island. The best time for snorkeling is the tide. Maldives is one of the world’s leading dive destination. The island's only dive center, Elite Divers offer dive holiday packages and a full range of beginner and diver development courses in North Ari Atoll of Maldives. To all those experienced divers simply wishing to holiday and dive in the magnificent sites the Ari Atoll has to offer, you won’t be disappointed. The dive shop offers boat fun dive trips to wide range of fantastic locations and you could even further your diving qualifications with Elite Divers. If you want to learn to dive or simply advance with your diving qualifications the dive center offers an extensive range of diving courses PADI. I would like to add that considering the monopoly (and the name of the diving center) - the prices for diving in Mathivery are quite high, so if you are an avid diver, it is better to choose Rasdu or Ukulhas for your underwater adventure. A budget vacation to Mathiveri is filled with fun, adventure and excitement. One can embark upon a number of activities while coming on a holiday to this island. There are a number of things to do in Mathiveri, which will make your vacation thrilling and exciting. Most of exursions by affordable prices and the staff will organize and accompany you on most activities and will go an extra mile to make your trip memorable. 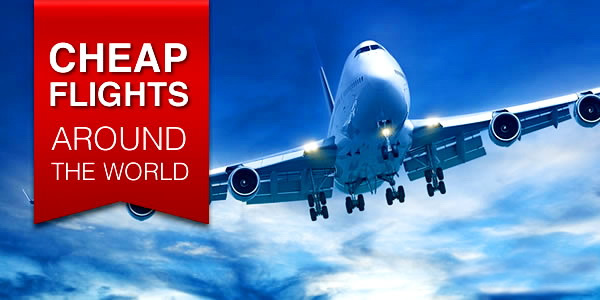 The staff is flexible, you can ask for a trip anytime you want, anyway, if you go in groups there are some discounts. Snorkelling Safari is a great way to discover marine life of Indian ocean. By speed boat you transport to a nearest reef in the open ocean. Expect to see a lots of live coral, schools of colorful fish, including sharks, rays and turtles. A depth of approximately 6 to 10 foot with a very deep drop off. Next trip's highlight is a shipwreck and snorkelling there again. The guide will be with you all the time in the water to make sure that everyone was okay. The exursion is about 3 hours long. Night/sunset fishing is a great experience (in some guest houses you have to pay extra for the sunset trip). You go sail about 6pm and by 6.30 you are hand line fishing. All caught fish use for lunch or dinne. You return back at about 9pm when they BBQ your catch for the evening meal. Dolphin Safari by a speed boat out in the ocean, Once you find them dolphins swim with the boat. This trip can be am or pm and last about 3 hours. To see and swim with Mantas is dream of all visitors to the Maldives. Once you spot the Manta Rays you jump in and swim with them, they are not shy and about 8 or 10 foot across, they swim back and forth feeding so you don't have to move far they just keep coming past. This is a true fantastic experience, a highlight of the holiday. The above trips are about $35 to $50 each depending on how many people go and it will be just your party or guest house guests, drinks are the same as at the guest house $2 each coke, sprite, bitter lemon, water is free. If you're a seafood fan try night lobster hunting to enjoy this delicacy after. You head into the night harbour armed with torches and gloves and spend 2 hours with your snorkelling kit lobster hunting. If you are lucky expext a lobster feast. It is cost $22 to hire the torches and buy batteries from the dive centre. The main highlight here is that they feed the sharks and rays at night after the restaurant has closed, Its a must see if you go. Nika has its own time zone 2 hours ahead, so you can see the sun come up at 8am instead of 6am on Mathiveri. Again one of the staff will take you and collect you on the boat. Picnic Island is an islet about 50 meters away from the beach to the left, you can walk through the sea when the tide is out about chest height or you can swim. The staff can take you there by boat with sun beds, parasols and a cool box full of drinks. This is an uninhabited Island with some trees in the middle and you can spend whole day here to swim, sunbathe and snorkel. The food is great! You can enjoy both as local and continental food. Most of the meals are Maldivian dishes, authentic and fresh. Breakfast with juices, minced tuna-coconut, chicken sausages, paratha and bread butter is sufficient to start new day, but all tasted good. Try their local breakfast, mashuni and roshi! The soups are great too but more spicy. The local chefs are very talented and every meal is fantastic. Expect fresh fish every lunch and dinner with a rice dishes, pasta dishes ( plain, garlic, vegetable, tuna, chicken ) various curries, home made coleslaw and deserts or fresh fruit, The breakfast consists of toast, (jam, peanut butter, choc spread) cereal and a tuna salad you put on a wrap. Yummy. Want marmalade - no problem, they get it, They can cook western food, including Pizza and chips for one lunch time and that too is great. 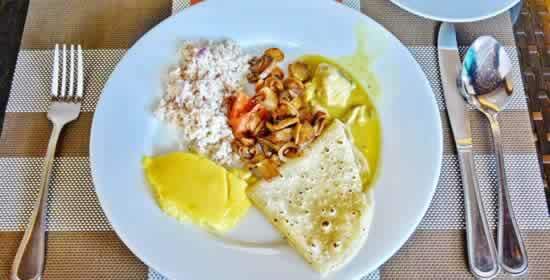 In Kudos Stay, they have good breakfast and also you can enjoyed many times their buffet dinner with local twist. In addition, you can ask some special dishes if you like something special. 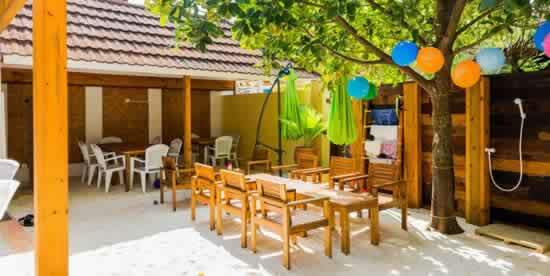 Friendly and relaxed ambiance creates Pizza Palace at Mathiveri Inn. It is a small bar where you can go to take a cup of coffee, play table football, listen to music or just meet and talk to friends. The pizzas are delicious cooked fresh straight from their pizza oven. 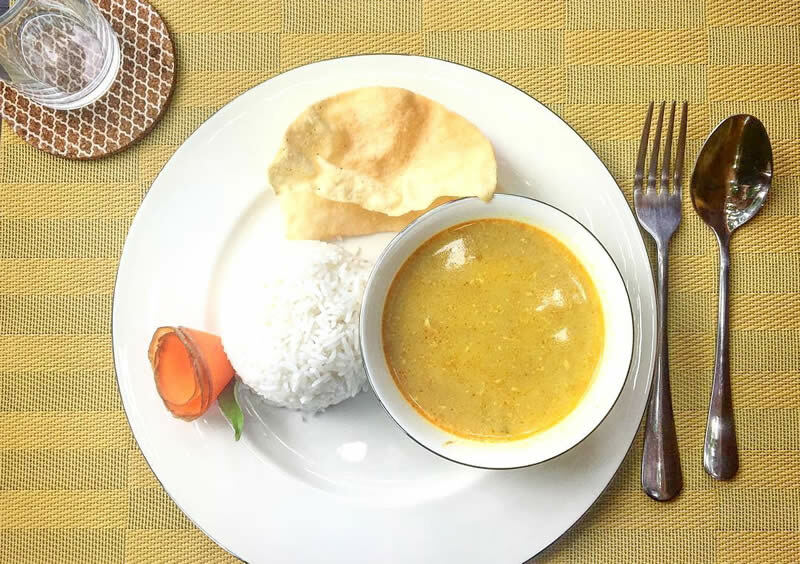 At other meals we recommend a some delicious soups (chicken, noodle, fish) and some tasty fresh fish, local curries, chicken dishes and even tuna pasta. All very tasty and then a choice of fruit or cake for dessert. Today (October 2018) there are 7 hotels on Mathiveri Island. 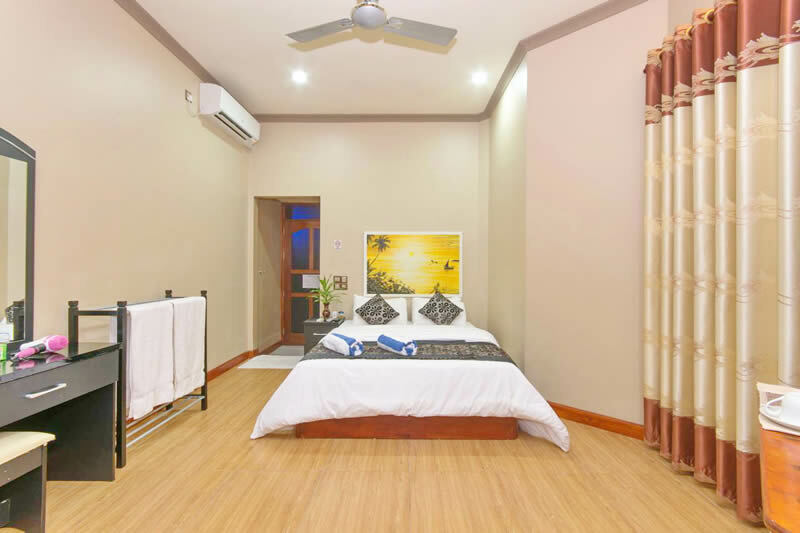 Keep in mind that this is a budget guest houses, so it is most suitable for young couples, friends, or whomever wants to experience Maldives on a budget. 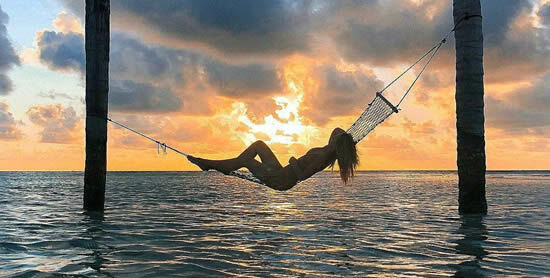 The service and accommodation reflect this type of laid back, relaxed and simply way of living. Comfortable, new, clean, spacious rooms, a some with an amazing view from the private balcony to the ocean and to the beach in front of the pension shaded by swaying palms (it is worth paying a little bit more for the sea-view room). Rooms are equipped with with AC, TV, comfortable bedding and bathroom with hot/cold water. There is a kitchen on the ground floor, where you can get water bottles, coffee/tea, fruits and snacks. All rooms are fitted with international electric wall sockets so all plugs will fit. Generally, staff is very friendly, helpful and caring.